Although you can NOT send files via Bluetooth between iPhone and Android , you can still transfer your photos, music and files between both smartphones in a very similar way (direct pairing), but with WiFi . And it is much faster than using slow Bluetooth connectivity. At home i have three Android phones and an iPhone. Transferring files between two Android phones is easy using Bluetooth. But Sharing files between an Android and the iPhone doesn't work that way. While it seems that both devices are connected, when sending a file, the iPhone will say that the Android is an incompatible device. There are two possible ways to transfer files between an Android and an iPhone over your home wifi network. The first and the most complete is installing the same application on both your Android and iPhone. The second requires you installing only one application on your Android device, but this option doesn't complete the job(I'll explain why). Above: sending 23 photos from the iPhone. Below: Receiving photos on Android. 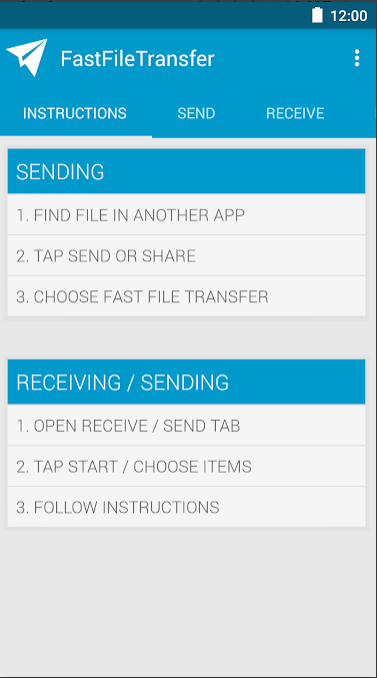 Using the above image illustrated example, you can see how to send iPhone files to Android with this application (one of the best for this task). Only photos were used in the image example, but you can send any kind of files. 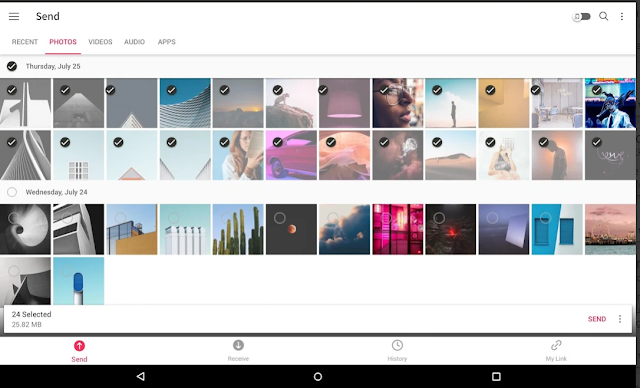 The process is the same if you want to do it the other way around, e.g share files from Android to iPhone. 1. You have to install this application both on Android ( available in the Play Store ) and your iPhone ( available in the App Store ). 2. Open the application on the device your are using to send your files. 3. In the "Send" section, choose the type of file to be sent (photos, videos, contacts or other files). 4. Select the files in the browser that will open and press the "Create Key" button. A 6-digit code will appear. 5. On the device that will be receiving the files, open the application and, in the "Receive" box, enter the 6-digit code shown on the sender smartphone. 6. Press the Enter button to start the file transfer. The only requirement is that both devices are connected to the same Wifi network. This app is not only useful to connect an iPhone with Android and transfer files. It can also be used to send large files between two Android phones, because it is much, more faster than Bluetooth. The advantage of this application is that it is only important you install it on your Android phone, but the limitation is that it only allows you to send files from Android to iPhone (you can not send from iPhone to Android). In summary, this application creates a Wifi access point(hotspot) on the Android phone and the iPhone must join that access point to get the file or the shared files. The step by step on how to use is explained below. 1. Download and Install the application on the Android and open it to configure the Wifi network data. 2. 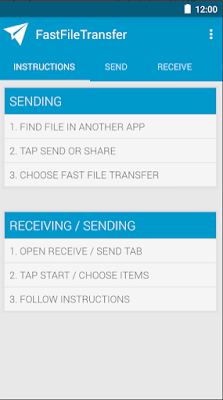 You can only send file using your phone's file manager not from the app. Done step 1, exit the application, go to the files of your Android and locate what you want to send. 3. You will have to share it (press and hold on the file to open the system's share menu). Choose "Fast File Transfer" from the options. The application will open and indicate an IP address at the bottom (a string of numbers separated by dots). 4. On the iPhone, look for the name of the Wi-Fi network that you created on the Android and connect to it (use the password you set). Finally, open the web browser of the iPhone and enter the IP address that the Android showed, in the box where the URL of a page is placed. 5. The iPhone browser will show the file shared by your Android and you can save it. 6. Instead of using the IP address, the iPhone can also read the QR code offered by the Android to obtain the file. The iPhone should have a QR code application reader installed to read that code. To use Fast File Transfer it is necessary that both phones are close due to the limited reach of the Wifi network created by the Android. Both applications are used to send any type of file. It does not make much sense, but I send an APK between one phone and another, which is to prove that any file can be shared. Note : The tests of these applications were made with a Samsung Galaxy S3 with Android Jelly Bean 4.3 and an iPhone 4 with iOS 7. This probably can also work between an Android device (tablet or smartphone) and an iPad or an iOS device in general.